The rest of this page refers to PicknBow 2018. It will be updated later. Another camp, another year. Let's start with the instructors, shall we? We have assembled an A-list of great musicians to lead the workshops: Picknbow veterans Danny Gotham, Jane Peppler, Jon Shain, Joe Newberry, Jim Watson, Kenny Jackson and Bobb Head.....will be joined by (drum roll, please...) Laurelyn Dossett, and FJ Ventre! The cost will be $260. We will once again have use of the two big rooms across the hall (where the Yoga and Fabric studios are).We are also pondering something (workshops and/or informal jams) on Friday afternoon. That is TBD, and as we get feedback from campers, we'll keep you posted. Otherwise, the camp will officially begin with the Friday evening "meet and greet". Once again, we are planning a Picknbow songbook as this year's official "swag". Picknbow coffee cups and t-shirts will be optional, and we will have more information about both soon. We anticipate a particularly strong interest in this year's camp, so early sign up and payment is highly recommended. Contact Danny at steelstringer@gmail.com to make reservations or if you have any additional questions. 6 pm to 7 pm: Arrival for the Meet and Greet. 7 pm to 9:30 pm (approx. ): Meet and Greet, introductions, instructors will talk briefly about the workshops, we'll put up the schedule. Then — lots of informal music making for all of us! 9:00 to 10:00 am: Arrival, coffee, etc. closing words, closing songs, and clean up to follow. PicknBow fee is $260, which includes approximately eight hours of workshops. Enrollment is limited. DANNY GOTHAM (guitar, mandolin, ukulele) grew up in Upstate NY in the 1960s and got the bug to play guitar when the Beatles were televised into his family's living room. Since that time, he has developed into a master flatpicking and fingerpicking instrumentalist, cutting his musical teeth playing in various rock, jazz, blues, bluegrass and country bands. He was a member of the Racquette River Rounders—an eclectic trio that garnered a loyal fan base in the Northeastern US. His next group was Summit, a bluegrass band in which he played mandolin, featured the 1984 National Bluegrass banjo champion, Chris Leske. Summit performed as a featured act as well as backing up bluegrass legends Bill Keith and Frank Wakefield. In 1980, Gotham took Second Place in the prestigious National Fingerpicking Guitar Championship in Winfield, KS. His most recent musical collaborations have been as accompanist to the great folksinger Tom Paxton and original "Prairie Home Companion" music director, Peter Ostroushko. As a teacher, he has maintained an extensive private student roster, and conducted numerous workshops, since 1974. He instructed at the Winnipeg Folk Festival in 2008 at the Summer Acoustic Music Week camp in 2010, and Millwood Guitar camp in 2011. His incredibly wide range of musical experiences has given him the ability to teach almost any student, regardless of style, instrument or level of expertise. Gotham has performed on the nationally syndicated radio broadcast Michael Feldman's "Whad'ya Know?" He appeared on the soundtrack of the PBS film "Hungers of the Soul". And in one of his more unusual gigs, he was the ukulele tutor for Tom Selleck as the actor prepared for the Broadway production of "A Thousand Clowns". Click below to hear Danny Gotham and Peter Ostroushko perform "Benny's from Heaven"
Joe's songwriting is characterized by the same clean, elegant style as his banjo playing. Musicians in the folk and bluegrass world often record his songs. The Gibson Brothers' version of his song Singing As We Rise, featuring guest vocalist Ricky Skaggs, won the 2012 IBMA "Gospel Recorded Performance" award. In 2013, Joe shared co-writing honors with Eric Gibson for the IBMA Song of the Year, They Called It Music. Joe was a frequent guest on Garrison Keillor's A Prairie Home Companion, and was recently featured on the Transatlantic Sessions tour in the United Kingdom with fiddler Aly Bain and Dobro master Jerry Douglas. In addition to performing solo, Joe plays in a duo with mandolin icon Mike Compton, sits in the banjo chair with old-time music legends Mike Craver, Bill Hicks, and Jim Watson, and also performs with the dynamic fiddler and step-dancer April Verch. Joe grew up in a family full of singers and dancers. He took up the guitar and banjo as a teenager and learned fiddle tunes from great Missouri fiddlers. He came to North Carolina as a young man and quickly became an anchor of the incredible music scene in the state. Still going strong more than 30 years later, he does solo and studio work, and plays and teaches at festivals and workshops in North America and abroad. Click below to hear Singing As We Rise and I Get My Whiskey from Rockingham. JANE PEPPLER (vocals, violin, viola, English concertina) teaches and performs early and traditional music (including klezmer). She's given concert presentations on her Yiddish theater song research at the Library of Congress, the Yidishkurz in Warsaw Poland, "Trip to Yiddishland" and elsewhere. She is owner of the Skylark Productions record label, engineering and producing recordings for local acoustic ensembles. She taught fiddle and voice at Pinewoods Camp "Folk Week" and at the Village Harmony summer sessions; she directed the Triangle Jewish Chorale for fourteen years. She currently performs with the world music group Mappamundi. As director of the Solstice Assembly, she was featured on NPR's Weekend Edition; she researched, arranged, and performed music of the British Isles and Colonial America for nine years, performing at the Smithsonian institution and receiving a grant from the National Endowment for the Arts and taught for more than two decades at the Duke University Short Course Program. She wrote for SingOut! magazine, wrote several songbooks, and has been published in the Journal of the English Folk Dance and Song Society. At Yale University she studied medieval music with Alejandro Planchardt, fiddled with the Yale graduate symphony orchestra, and sang with the Yale Slavic Chorus. In Boston she managed the Locrian String Quartet and sang with Laduvane and co-founded the Festival of Light and Song. She has made more than two dozen recordings and has published two books of newly unearthed Yiddish theater songs of the Jazz Age (1920s-1930s) and three companion cds, as well as two cds of music from the Lower East Side around the turn of the 20th century (see YiddishEmporium.com. Jane will be offering vocal coaching, making up harmonies, teaching songs, country song singalongs, home recording techniques, and conducting a klezmer music workshop if called for. Klezmer is rowdy, high energy Jewish instrumental music. Pretty much any instruments except bagpipes welcome. Contact Jane Peppler with questions. Click below to hear two songs she wrote: Ikh ken shoyn nit mithaltn (I Can't Keep Up), the song Jane wrote in Yiddish and performed at "Der Yidisher Idol" in Mexico City in 2015 (she in fact won the Grand Prize, which was a stale challah on a tray) and Ben Franklin's Aphorisms. JIM WATSON went to his first fiddler's convention in 1965. He played with the Hollow Rock String Band and in 1972 was a founding member of the Red Clay Ramblers playing mandolin, guitar, and autoharp. In 1988 he started playing with Robin and Linda Williams and their Fine Group. He works with the world-famous country duet Duke LaCrosse and Pinky Wyoming and plays string bass with the Green Level Entertainers, a bluegrass band with Shady Grove Band guitar player Jerry Brown and Mandolin Central proprietor Tony Williamson, Gary Williamson and New Deal String Band lead singer Leroy Savage. Besides his recordings with the Red Clay Ramblers and Robin & Linda Williams, Jim has three solo CDs: This World Would Be All Sunshine, Willie's Redemption, and Don't Tell Me, I Don't Know. Both include O'Blurs Mike Craver and Bill Hicks on some cuts as well as many more of Jim's friends. JON SHAIN is a veteran singer-songwriter; his newest disc, a duet album with Joe Newberry, Crow the Dawn, was just released in January, 2016. He studied with Duke jazz professor Paul Jeffrey and learned the piedmont blues tradition firsthand by playing in Big Boy Henry’s backing band. It was at this time that Shain also got to meet and play with John Dee Holeman and a number of the great older NC blues players. In addition to the new album with Joe Newberry, and a live album with Jon Shain Trio, Jon has released eight studio albums. He teaches Piedmont blues fingerstyle guitar and gives workshops in songwriting and blues guitar. Click below to hear "Ordinary Cats." KENNY JACKSON established his reputation as a gifted guitarist during his tenure with Leftwich, Higginbotham, and Jackson in the mid-1980s, co-founding the acclaimed old-time group the Rhythm Rats shortly thereafter. 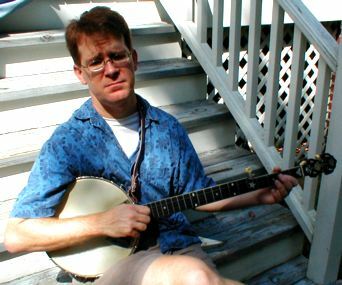 Jackson is a compelling singer, guitarist, and banjo player as well, distinctive in his interpretation of traditional music while being deeply rooted in old-time sources from the southern mountain region. Besides playing with Big Medicine, he is also a sought-after fiddle teacher, working with individual students in person and online, and at traditional music camps across the country. Click below to hear Kenny play Cousin Sally Brown. BOBB HEAD Bobb Head is a Texan transplanted to North Carolina, contributing top-notch guitar, banjo picking, and harmony vocals - and he is a bass player whom any string band would covet as a member. When he's not playing with Big Medicine, you can see him with the Stillhouse Bottom Band; with Dueling Shoes, a percussive dance ensemble; and the Deep Phat Friars, an irreverent southern-fried contra band. He has also performed with a number of pickup bands. Before moving to North Carolina, he played with the Privy Tippers in Tucson and, before that, with the Self-Righteous Brothers in Houston. Click below to hear Bobb Head and Kenny Jackson performing Dunbar in Ulster, Ireland. LAURELYN DOSSETT (singer/songwriter) lives and writes in the piedmont of North Carolina, and her songs tend to reflect the stories of the region, both traditional and contemporary. Her songs have been appeared in film and television, and have been recorded by Grammy-winning artists such as Levon Helm and Rhiannon Giddens of the Carolina Chocolate Drops. Laurelyn’s most recent songwriting project is Leaving Eden, a new play with music written with playwright Mike Wiley, which premiered at Playmakers Rep at UNC in April 2018. She has partnered with Triad Stage's Preston Lane on six plays featuring regional folklore and original music. Her song cycle, The Gathering: A Winter's Tale in Six Songs, was commissioned by and premiered with the North Carolina Symphony in November 2011. Laurelyn lives, writes and gardens in Stokes County, NC. Click here for more information. Click below to hear "Anna Lee." FJ VENTRE (bass), based in Chapel Hill, plays upright and electric bass and sings with several acts from The Triangle area, including Jon Shain, Wyatt Easterling, Wes Collins, the Bennys, Nantahala and others. He has also played with the Chris Stamey Group, the Swang Brothers, Rebecca and The Hi-Tones, Mel Melton and the Wicked Mojos, The Stars Explode, and Tom Maxwell. FJ is the owner-operator of Good Luck Studio and has recorded and mixed projects for Jon Shain, The Swang Brothers, Jeff Hart, Hailey Clark, The Infidels, Tad Walters, and Tom Maxwell, to name a few. Click below to hear FJ Ventre and Jon Shain perform "Bandits." PicknBow fee is $260, which includes approximately eight hours of workshops and the PicknBow songbook. Enrollment is limited.